Mowglis campers age 10 and up choose 100% their activities, which we call “Industries.” Campers ages 7 to 9 in the Cub Program rotate through (almost) all of our activities, experiencing each as a group. Each Industry has a particular series of skills or ribbon requirements that a camper must master to earn that Industry’s ribbon. The ribbons are valued for the skills and accomplishments they represent. Campers who earn four or more ribbons are invited to sit in the Inner Circle at the campfire in an end-of-summer ceremony that is both moving and memorable. During each of the daily industry periods, campers work with experienced counselors to have fun, learn new skills, and progress toward mastering those skills. Our highly skilled and enthusiastic instructors, and the ribbon requirement structure of each Industry encourages Mowglis campers to become experienced and proficient in their chosen Industries…all the while having a ton of fun! There are three, one hour-long industry periods each day. Two of these periods last for two weeks and allow campers to build solid skills in their chosen pursuits. The third daily activity period is a daily sign-up, where campers select from our wide variety of land and water activities for just that period. Campers are encouraged to try all the Industries and then choose where they want to specialize. As campers become proficient, they help teach younger campers. These experiences, new skills, and achievements often turn into lifelong interests and hobbies. Visit the Mowglis daily schedule to learn more. The Mowglis archery program offers an instructional opportunity for boys from novice to expert. Campers begin with the fundamentals of equipment safety and proper shooting technique. The Golden Arrow Husky Mark is awarded after displaying skill and safety and scoring a requisite number of qualifying targets. The Mowglis Craft Shop buzzes with activity all summer, with a whole range of opportunities available, including leatherwork, drawing, painting, and pottery. The Black Ribbon is earned after a series of self-chosen projects are completed. One of the more difficult and prestigious ribbons is the Orange Ribbon, awarded for proficiency in axemanship. Many years ago, Colonel Elwell developed a technique for safely teaching this skill, and Mowglis is one of the few camps that do it. Boys learn to use a knife, a hatchet, and then ax. The Orange Ribbon is available to campers ages 12 and older, with permission from home. They learn to split, chop, and finally to fell and to use their tree for a project to benefit the camp. Mowglis is a very musical place. From “Reveille” in the morning to “Taps” at lights out, the Mowglis day is run by bugle calls. What is a bugle? It is like a trumpet, but without valves. Who plays the bugle calls? Campers do! That’s right, all of the daily bugle calls are performed by our campers who learn how to play them in Bugling Industry. Our campers take great pride in learning all the bugle calls and helping run the camp’s day. In addition to the bugle, our campers sing, play the piano, and bring instruments from home. We have four pianos at camp, including one upright Steinway, which the campers are encouraged to practice on. Yes, Camp Mowglis is a very musical place indeed! A basic foundation in camping skills is a requirement of all Mowglis Graduates. The Green Ribbon provides instruction in camping, backpacking, Leave No Trace principles, wilderness first-aid, trip-planning, basic orienteering and much more. Every Mowglis alumnus remembers completing his “fire-in-the-rain” requirement. Mowglis has a long tradition of teaching boys the skills needed to paddle canoes safely in flat-water and rapids. The Canoe Safety, which covers basic flat-water boat handling, is a requirement for all Mowglis Graduates. Campers seeking the Red Ribbon will develop the skills needed to go on an exciting whitewater trip at the end of the summer. Mowglis Alumnus and Trustee Charles Walbridge, a nationally known whitewater expert, returns to camp each summer to pass on his skills. Charlie is a pioneer of American whitewater, and you can learn more about him by going here. One of the defining aspects of the Mowglis program is rowing or crew. All boys ages 10 and up learn to row in our unique Mowglis crew boats. These boats are custom built and differ from traditional shells in that they are more stable and better suited for learning. For more information visit our crew program page. Those who are particularly interested in crew pursue the Maroon Ribbon and also learn to row in our 4-man shells and single-man sculling vessels. Every summer, several skits, and plays are learned, created, and directed by the boys and are performed for parents and alumni on visiting weekends. Foil, bout, epee, saber, en-garde… sound like a different language? Well, it won’t once you’ve learned to fence at Camp Mowglis! Fencing is one of our most popular Industries; it helps build motor skills as well as hand-eye coordination, reflexes, and strategy. We have all the necessary protective equipment, a spacious fencing studio, and professional instructors who ensure that this Industry is taught safely. So… En-garde! Camp Mowglis is on one of the ten cleanest lakes in the world and is home to a LOT of fish! People come to Newfound Lake from all over the world for the fishing, and with the guidance of our fishing guide, our campers learn everything necessary to become bonafide anglers (fishermen). In addition to the early-morning fishing outings, we also teach fly fishing and fly casting. These are life-long skills which will undoubtedly come in handy. Remember: give a person a fish, feed him for the day. Teach him how to fish and feed him for life! Hiking and camping trips are integral parts of the Camp Mowglis experience. Thursday is hiking day, and every hiking day, each age group goes on a different hike. The youngest campers start with easier day hikes; the older campers go on challenging multi-day hiking and camping trips. Being located in the White Mountains of NH means there are hundreds of hiking trailheads within 45 minutes drive of Camp Mowglis. As the summer progresses, each hiking trip is slightly more challenging than the week before. This allows campers to increase their hiking stamina and camping skills. The Brown Ribbon is acquired by campers once they gain skills in orienteering, accumulate trail miles, and climb a number of White Mountain peaks over the course of their Mowglis career. Nature, The Purple Ribbon, is awarded to those boys who have learned a good deal about the plant and animal life around them, and have an understanding of human interactions within the ecosystem. To learn more about the Mowglis Hiking Program please go here. Campers in the Nature Industry learn all about the plants, animals, and ecosystems surrounding Camp Mowglis. From the lake to the mountains and forests, Nature studies at Mowglis teaches campers all about the natural world around them! Stand Up Paddle Boarding (SUP’ing) is offered as a sign-up activity and is a great way to get out on the beautiful waters of Newfound Lake. Never been on a SUP? No worries! Our instructors will have you up and paddling in no time flat. You’ll be amazed by how stable the paddle boards are as you cruise around. Standing up above the water gives a great perspective on the lake and is a great way to enjoy the lake! The Black and White Ribbon teaches campers the basics of photography. They learn how to take photos, and develop an understanding of the equipment and the development process. Respect for firearms, knowledge of safety precautions, and target shooting have been a part of the Mowglis program for generations. Riflery teaches boys patience, how to listen closely and follow directions, and how to responsibly handle dangerous things. To earn the Red, White and Blue Ribbon campers work hard to achieve all the riflery medals; doing so requires a lot of perseverance, which teaches boys to set and work towards lofty goals. We are very fortunate to be located only minutes away from a world-class rock climbing area in Rumney, NH. In addition to being a fantastic climbing area, Rumney is also an excellent teaching area as the cliffs are not very tall, and there are excellent anchors to set the climbs on. Our climbing instructors are American Mountain Guides Association trained and certified climbing guides who live and breathe rock climbing. While scaling a rock wall may seem very risky, if it is properly instructed and supervised, it is fun, safe, and exhilarating! All campers spend time with their dorm-mates at the Mowglis Ropes Course to work on teamwork, communication, and problem-solving skills… and have a great time along the way! Our Ropes Course was professionally designed and built on a peninsula right on the lake and will take you to the treetops safely “belayed” by our professionally trained and certified ropes course facilitators. The Ropes Course is exhilarating, challenging, and a LOT of fun! The Silver Ribbon includes the skills needed to handle traditional wooden rowboats. Campers who pass the Rowboat Safety Test can take a boat out on their own, or with a friend. 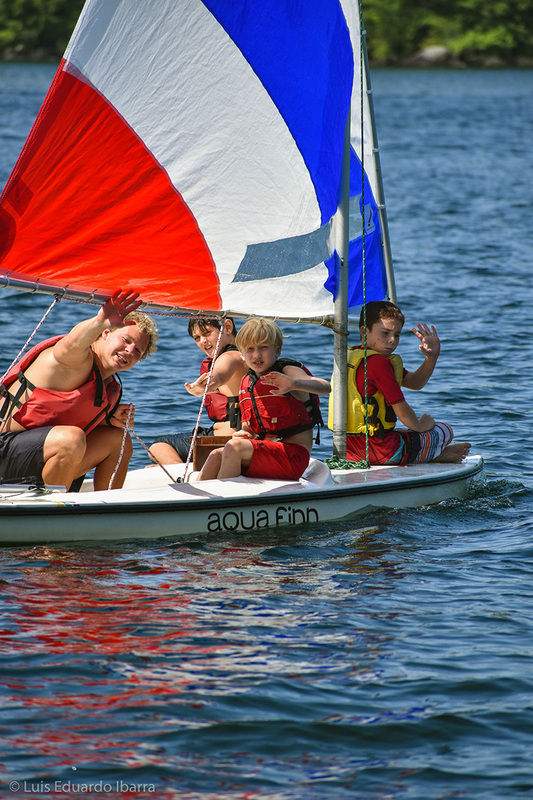 Mowglis has several different sailboats for recreation and instruction. Recently, three 420s were added to the program. All the parts of the boats, safety, and sailing ability are taught. Newfound Lake provides a great place to learn how to sail. The Skipper’s Test qualifies a camper to take out a boat alone, and the Golden Anchor provides all the skills needed for a committed small-boat sailor. The Mowglis waterfront is a true gem, and campers of all ages learn to become strong swimmers. The White Ribbon follows the American Red Cross progression, which is a major part of the Mowglis program. All boys are encouraged to advance their swimming skills. Safety awareness and a certified staff make the waterfront a safe and fun place to be each day. Mowglis has two clay tennis courts for recreation and instruction. The Yellow Ribbon is a popular one, and many boys dream of the clay courts of the French Open. Woodworking is the Gold Ribbon. Boys learn how to use hand tools properly and receive basic instruction in power tools by highly qualified counselors. Projects such as tool boxes and bookshelves are constructed in the wood shop.